Following events in Canberra last week, Julie Bishop has announced she is quitting the front bench, and is expected to retire from politics at the next election. A frontrunner in the polls as preferred Liberal leader, Bishop nonetheless attracted no votes from her West Australian colleagues in the leadership ballot. She was knocked out in the first round of voting. As many have pointed out, the optics are not good. Malcolm Turnbull's cabinet had few women and of those, Bishop was considered a standout performer. Scott Morrison's new cabinet sports five women, less than 20 per cent of cabinet ministers. Yet diversity is about far more substantive matters than optics. While diversity encompasses a wide range of experience and attributes, I am interested here in gender diversity in government. Given that diversity among decision-makers leads to better decision-making and better governance, the question might be asked as to why Bishop is now sitting on the back bench. This begs the question also of why there are so few women in the ministry — or in Parliament, for that matter. The answer is power, and the structures that uphold it. We take for granted that women now have the legal right to political participation. Since Indigenous Australian women achieved the right to vote in 1962, all Australian women have been enfranchised and entitled to stand for parliament. Yet women's right to stand does not translate into female MPs or cabinet ministers. Despite comprising just over 50 per cent of the population, as at 2017 women represent only 28.7 per cent of elected representatives in the federal parliament. The Inter-Parliamentary Union ranks Australia 50th in the world in terms of women's representation, and notes a global stagnation in women's representation since 2015. Historically, men — older, white, able-bodied, heterosexual men, to be precise — have held political power. Men are therefore intrinsically associated with power. To this extent, it is not the office of MP or minister that has traditionally generated authority, but the fact that the person holding that office is a man. The office simply embodies the power that resides 'naturally' in men. We are even acculturated to the voice of authority as a man's voice. Media images are dominated by the faces of mature-looking men, and we hear their lower-register voices tell us important things. Men in authority fill our media, predominating in politics, in sport, as journalists, and as performers. These roles are highly visible. And they belong to men. By contrast, women are associated with children and home rather than leadership of public institutions. Public discourse surrounding childcare, for example, focuses on women. Certainly, so long as women are default carers of children, childcare is essential to free them for work. But there is little evidence of widespread assumptions that mothers and fathers should share childcare responsibilities. Instead we assume that women are responsible for childcare. "Morrison has said 'we are on your side'. Yet a cabinet lacking diversity will surely struggle to understand just what 'our side' is, let alone govern for all of us." Because we have internalised the norms of power and authority in our institutions — public institutions like Parliament, and 'private' institutions such as the family — it is easy to assume two things. First, that men are naturally suitable to hold public office, and secondly, that women are not. Former PM Tony Abbott said, for example, that there were some very good women 'knocking on the door' of cabinet. Yet the 'merit' argument held sway, and they did not make their way in. Merit of course upholds perceptions of power and authority which rest with men. It would be possible for parliamentarians to undertake unconscious bias training to overcome any adverse assumptions about women's competence. Such training is one approach to raising awareness of stereotyping, such as the assumption that authority resides with men rather than women. However, this would require the stomach to admit that stereotypes work with political processes to actively preclude women from power, from the point of pre-selection (notably in parties without quotas) all the way through to parliamentarians' unfriendly work conditions. Training is insufficient on its own to alter the structures that preclude women from parliament, but it may raise awareness of the barriers. Morrison has said 'we are on your side'. Yet a cabinet lacking diversity will surely struggle to understand just what 'our side' is, let alone govern for all of us. Until women flood the Parliament, those who benefit from the existing structures of power have little incentive to change. It would be nice indeed to think that they were 'on our side', implementing root and branch change to promote diverse voices in government. It is a shame to hear of Julie Bishop's future departure. The problem with politics in Australia is that it is only a popularity contest and if her own WA colleagues wont support her then she has no where to go. 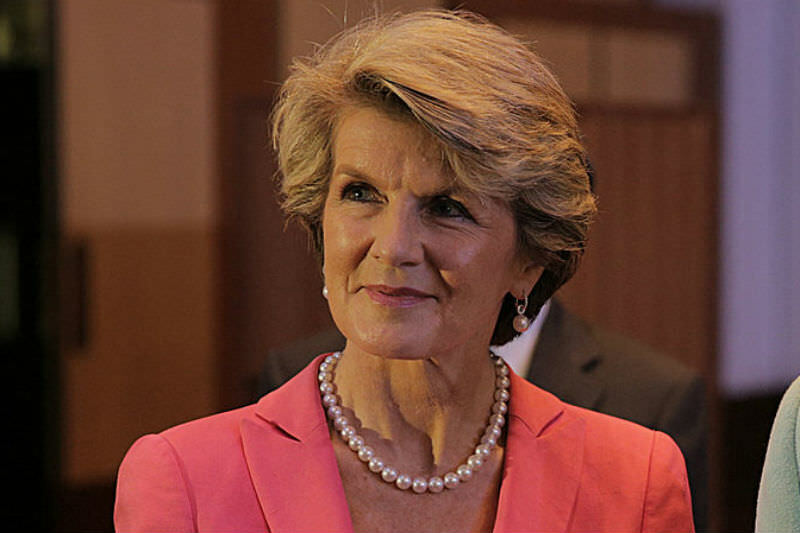 Whether she threw her hat into the ring to draw votes away from Dutton or not, she is no less worthy than Dutton to hold a portfolio and she has been doing a great job as Foreign Minister. In fact she is more worthy, because Dutton's human rights record is a sick joke. Even though the plot to destabilise Turnbull was a peevish revenge tactic cooked up by Andrews and Abbott, (disguised as a policy challenge), JB should not have to suffer. Future politics in this country is not about the 28.7% representation of women in Parliament. It's a rich boys club. Eureka, ostensibly at least, is a catholic forum based heavily on Political correctness, yet what real say do women have in a church hell bent on refusing women equal rights to ordination and participation in any decision making process except in a token manner? Julie Bishop is an ideal role model. She has never been a pretend man or the token woman. I don't agree with all she does but I have never disagreed with the way she does things. I was delighted to hear she will remain in our Parliament. Possibly one day we will get a female Prime Minister strong enough to survive the slings and arrows. There is nothing easy about the job. Having 50 percent of parliamentarians as women would positively transform Australian political discourse and the way decisions are made. I for one have had quite enough of the current dualistic and aggressively destructive paradigm. I would say exactly the same for the church Heirarchy! Women are going to be vital for the cultural and spiritual transformation that is vitally needed in the existential crisis we/they are in.